Under normal circumstances, microwave cheesecake would be an ideal summer dessert for the sole reason that it doesn’t require you to turn on your oven. However, this summer has been anything but normal. So, instead, I’m going to tell you that these little cheesecakes are ridiculously easy, super tasty and highly transportable and those are three very fine reasons to consider trying it out. And, hey, if the forecasters are right and we’re going to sail through the rest of August on a heat wave, then feel free to use not wanting to turn on your oven as an excuse, too. The more rationale, the better, I say. Not that cheesecake should require any rationale. Now, I’m not going to lie. If you’re looking for a silky smooth cheesecake with nary a crack marring the surface, lovingly cooked in a water bath and chilled overnight in the fridge, this isn’t the recipe for you. 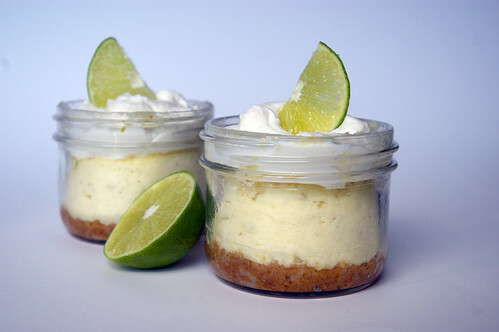 If you’re looking for something you can whip up in seven minutes — including cooking time — that sits in the fridge for an hour and then can be devoured, giving you the same tart lime cheesecake taste as the regular kind with almost the same amount of smoothness, then this is the recipe for you. The hardest part was waiting for it to chill enough. And the best part was because I used mason jars, I could just slap on a lid and take it with me, which would be ideal for picnicking or making an office lunch a little more luxurious. I used two one-cup (250 mL) mason jars to make the cheesecakes and had a little bit of batter left over. In hindsight, I can tell you I filled the jars a bit too full. At some point, I may want to sit down and reexamine the subject of portion control. At the time, though, it seemed like a good idea. After all, the recipe said it makes two to four cheesecakes, so two seemed more than reasonable. Please take my suggestion and make at least three, for a few reasons: 1: These jars are pretty giant and the cheesecake is, naturally, a bit rich and may be better in a slightly smaller dose. 2: Three or four cheesecakes means you can share more easily with more people. That or you can spread them out over several sittings. 3: You won’t be watching anxiously through the microwave door as the cheesecake mixture souffles up and over the jars’ edges, threatening to spill all over the rotating tray. As it was, all that fretting was for nothing. They didn’t spill, but I think it would have been better without the panic. Out of the microwave, they settled nicely into a slightly concave top. I filled that with whipped cream — purely for esthetic reasons, of course. But later I thought some fresh fruit would have been nice. 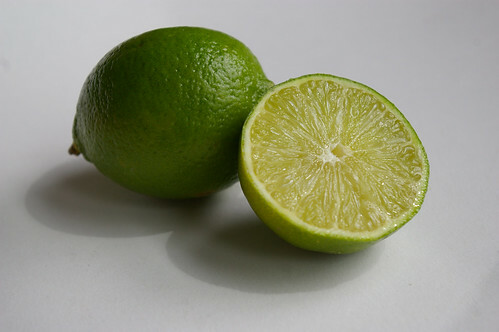 I liked the slightly tart taste of limes countering the richness of cheesecake, but suspect this recipe can be easily adjusted to suit other flavours, such as lemon (by switching the zest and juice to that fruit) or a straight-up vanilla cheesecake by omitting the citrus and adding a teaspoon or so of vanilla extract. That would be particularly delicious topped with summer berries or a fruit compote. After all, it only takes about seven minutes to try a new variation. The tricky part will be waiting the hour to see how it tastes. Combine the graham cracker crumbs with melted butter and 1 tbsp (15 mL) sugar. Divide between two to four 1-cup (250 mL) jars or ramekins and press into the bottom. Mix the rest of the ingredients until smooth. Divide evenly into jars or ramekins with crumbed bottoms. Place in microwave for 2 minutes. The top of the cheesecake should appear dry when cooked. If it doesn’t look quite done, microwave at 30-second intervals until the tops appear dry. (For my extremely full jars, I needed 2 minutes and 30 seconds.) If you don’t have a rotating microwave tray, cook for 1 minute then turn the jars or ramekins and microwave for another minute. Chill in refrigerator for 1 hour. Garnish with whipped cream or fresh berries and serve. I love this! What a quick and delicious way to test out flavor combinations. I’ll definitely try this tomorrow. Looks interesting! Not quite like my æblekage (crispy apple pie, originally from Denmark), but I love the butter-graham crackers combination as pie crust. these are way too cute. i threw away our microwave last january to make room for more counterspace. i haven’t regretted it since…until now. so, can these be made in a regular oven? Good question. I don’t see why not, but there seems to be varying suggestions on oven temperature and the length of time cheesecakes in ramekins have to be in there. (I saw temperatures varying from 325F to 400F during a quick search.) I’d also suggest considering a water bath since they will be baking for a lot longer than they’d be in the microwave for and this will be a bit gentler on them. Looks like Chez Pim has does done it. In fact, I recently had to say goodbye to my microwave (it died after putting in a solid service) and I have yet to replace it. Not sure if I will and knowing I can make baby cheesecakes in jars in the oven helps with that decision. I did some investigating and it looks like digestive biscuits are the closest thing to graham crackers. One site I found suggested using 1/2 digestives and 1/2 “rich tea biscuits” crushed together to make the equivalent of graham cracker crumbs. Brilliant! Can’t wait to make these for a picnic… perhaps this weekend to enjoy the leaves! I was wondering, can I use light cream cheese? Andrea, I’m not sure it will work with light cream cheese. If it’s a calorie issue, I’d just make smaller serving sizes by dividing it up amongst more jars or ramekins. Hi! 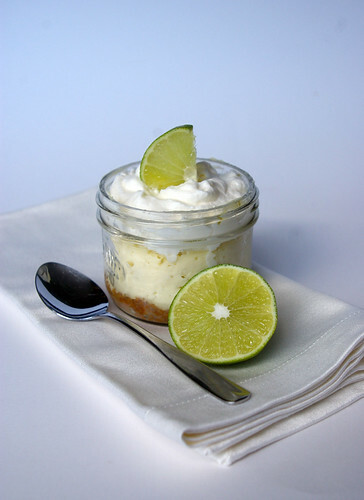 I came across your great blog and was wondering if you’d be interested in being a guest blogger over at Or So She Says…… (www.oneshetwoshe.com) and sharing your microwave key lime pie recipe with us? If you’re interested, please email Jessica at ladies@oneshetwoshe.com and I will send you the info- we’d love to have you! these little cheescakes r amazing..my friends thought i put alot of effort in them as i usually do for desserts,my little secret…whoever thought of this is plain genius!! On this sunny but 15 degree day here on the east coast, I am putting together great items for picnics! This is so one of them! LOVE LOVE LOVE IT! And the good news is that I don’t have to wait til summer to make it. Lovely picnic presentation as well! I found this recipe through pintrest. I just made it (subbed key limes) and it was fantastic! Thanks for the share. I just found this recipe and I posted it on my blog. Ladywiththeredrocker.wordpress.com. These are the cutest things ever! Just love ’em! Thanks for posting! I made these and they were awesome but I have a question~ Mine took a long time to bake and I’m wondering if I may have overdone it. My microwave only goes up to 700w, so I was wondering if you happen to know what wattage your microwave is at when you do this and what your suggested adjustments are? My tops never really looked dry in the microwave, so I just took them out when I got worried that I was screwing them up. Sadly, my microwave died shortly after making these cheesecakes. (Unrelated to making them; it was a pretty old microwave.) So, I can’t be entirely sure what wattage it was. It looks like the industry standard is 700w, so it’s possible that’s what I was using at the time. How long did you end up cooking them for? I’m sure an extra few minutes wouldn’t have made a huge difference and if they were tasty, then that’s all that really matters. Pingback: Pinning and more of the same « Now what?